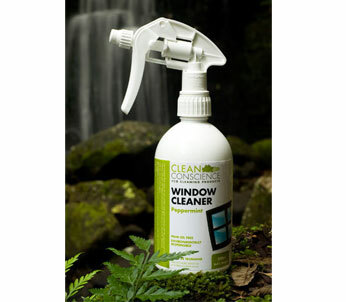 Clean Conscience Window Cleaner gives you a streak free finish on all glass surfaces and is very economical. The pure essential oil of peppermint is a multi tasker as a natural fly deterrent and effective cleaning agent. It is also safe to use on smart glass. Ingredients – pure Tasmanian spring water, apple cider vinegar, castile soap, pure essential oil of peppermint. Available in 500ml, 500ml refill, 5 litre, 10 litre with tap. Contact us for refills or bulk orders. Clean Conscience Window Cleaner proves that window cleaners do not have to be blue to work! This spray even works on the interior glass of cars and is infused with peppermint essential oil which acts as a natural fly deterrent. For more on Clean Conscience click here.